Oct. 16: War by telegram. The fall of 1861 is bereft of major fighting until Union Major Gen. George B. McClellan gets a disastrous battle going — by telegram. 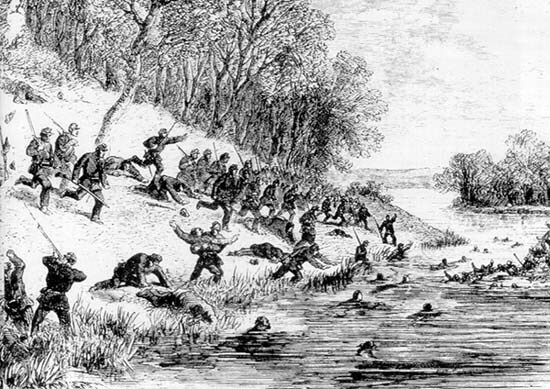 Oct. 21, 1861 witnesses a badly coordinated attempt by Union forces to cross in boats from Maryland to the Confederate-held Virginia side of the Potomac River, northwest of Washington. Their aim: to seize a key railroad juncture at Leesburg, Va. But Union forces will get no further than the steep Virginia slope of the Potomac riverbank at the Battle of Ball’s Bluff. It all began with a line in a seemingly innocuous McClellan telegram to a subordinate, Brig. Gen. Charles P. Stone. McClellan advises Stone, commander of troops along the Potomac, to “keep a good lookout upon Leesburg,” adding “perhaps a slight demonstration on your part would have the effect to move them.” Stone obliges by sending two Union companies across the river the night of Oct. 20, 1861. They scale the bluff and report back that it’s a dangerous, steep slope. The next day, thousands of Union troops begin crossing, their incursion begun. But Confederates above on the heights at Ball’s Bluff fiercely counterattack. Heavy Confederate cannon and rifle fire drives the green federal forces back down the bluff, many splashing mortally wounded and bleeding into the river. Others drown trying to swim away in uniform. When it’s over, hundreds of Union troops are dead and hundreds more are missing or taken prisoner — out of roughly 1,780 ill-trained Union troops seeing their first action. A leader of the Union attack, Col. Edward D. Baker, who served in the U.S. Senate from Oregon, is killed. Baker is a good friend of President Abraham Lincoln and the Union rout causes such an uproar in Washington that a congressional oversight committee is formed for the conduct of the war. On May 22, 1861, in what’s generally regarded as the first Union combat fatality of the Civil War, Pvt. Thornsbury Bailey Brown was shot and killed by a Confederate soldier at Fetterman Bridge in present-day West Virginia. 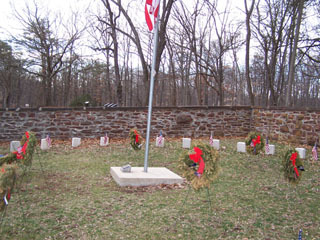 Click here for more information on this story and the location of his gravesite at Grafton National Cemetery. (AP) On May 23, 1861, voters in a Virginia convention ratify an ordinance for the state’s secession from the Union as a divided nation lurched toward all-out war. South Carolina had been the first state to secede in December 1860. It was followed afterward by six other Southern slave states, including North Carolina on May 20. Virginia initially was among states seeking a way out of the crisis and delegates initially opposed secession in February 1861. But the Confederate artillery attack on federal troops at Fort Sumter, S.C., in April joins other developments in shifting the mood on the political landscape. In late May, Richmond replaces Montgomery, Ala., as the capital of the Confederacy and its president, Jefferson Davis, arrived there to great fanfare on May 29, 1861. Arkansas, Tennessee and North Carolina secede this month, bringing to 11 the number of Southern states forming the Confederacy. On 27 April 1865, the steamboat Sultana exploded and sank in the Mississippi River near Memphis, Tennessee, causing the greatest marine disaster in U.S. history. Approximately 1,700 people, mostly discharged Union soldiers, lost their lives on a frigid spring night when boilers aboard the over-crowded steamer exploded. April 1865 brought turmoil in America with General Lee’s surrender, President Lincoln’s assassination, and John Wilkes Booth’s death. As a result, the Sultana tragedy was given few headlines in American’s influential newspapers. Launched from Cincinnati, Ohio, in January 1863, the side-wheeled steamer was named Sultana meaning a sultan’s wife, sister, or mother. It was considered one of the best steamers of its time with its new lightweight tubular boilers. The boat measured 260 feet in length and had the capacity to carry 1,000 tons while trimming only 34 inches of water; thus making it ideal for travel on the Mississippi, Ohio, and Tennessee rivers. It provided accommodations for 376 passengers including crew, which was the Sultana’s legal capacity. Like many boats during the Civil War, the Sultana came under fire. Twice in 1863, Rebel forces fired at the boat, causing heavy damage to its upper works. The Union ironclad Eastport also fired upon the Sultana later that year on the Mississippi River. As the Union began to seize more of the Mississippi River Valley, the Sultana began to carry troops, supplies, and cargo for the Federals. On 21 April 1865, the Sultana departed from New Orleans with 100 passengers and headed north on the Mississippi River. As the boat steadily moved upriver, a Sultana engineer noticed a leaking boiler and sought out a boilermaker in Vicksburg, Mississippi, to repair the problem on 23 April. The boilermaker, R.G. Taylor, told Captain J. Cass Mason that two sheets on the boiler had to be replaced. Concerned about time and money, Captain Mason told Taylor to patch the boiler and promised to finish he repairs once he reached St. Louis. Taylor disagreed with Mason, but made the patch for the Sultana anyway. 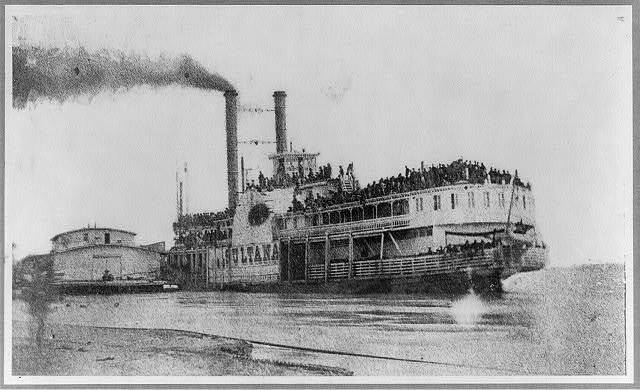 Owners of the Sultana, which included Captain Mason, anxiously awaited the layover in Vicksburg. In Vicksburg, they hoped to find former Union prisoners of war from Cahaba and Andersonville prisons because a government contract offered boats five dollars per enlisted soldier and ten dollars per officer to take them back north. Even though there were two steamboats docked at Vicksburg, Captain Mason and other Sultana officers lobbied prison officials to let their steamboat take all the soldiers. The tactic worked. The Sultana left the dock on the evening of 24 April 1865 with approximately 2,100 troops, 200 civilians, and cargo, more than six times its legal carrying capacity. The former prisoners, weakened from disease, dysentery, and malnutrition, were cramped together but in good spirits because the war had ended, and they were only a few days from reaching their homes. On the evening of 26 April, the Sultana reached Memphis, Tennessee, to unload cargo, and then crossed the river to Arkansas to buy coal. Soon afterward, the boat slowly moved against the stream at 1:00 A.M. despite continued boiler problems and a strong current. Meanwhile, the Mississippi River rose to flood stage from spring rain and levees and dikes ruined by the war. Seven miles north of Memphis at 2:00 A.M., the Sultana swung around a bend and began to labor through Paddy’s Hen and Chicken Islands. An explosion instantly tore through the decks above the boilers. Red-hot shrapnel and steam from the boilers killed or maimed scores of passengers instantly. The eruption hurled many people into the air and out into the frigid river. Passengers threw doors, shutters, mattresses, bales of hay, and anything else buoyant overboard. Few life preservers, only one lifeboat, the flood conditions, darkness, and weakened passengers made the chances of survival slim. The explosion was audible in Memphis, but it took two hours for help to arrive. A steamboat heading down river and boats from Memphis went to help after hearing the screams and seeing the flames. But for most, it was too late. While rescuers attempted to save people still clinging to makeshift rafts or treetops, they saw the river full of dead bodies floating downstream. Boats searched for survivors all morning but stopped looking by midday. Of the estimated 2,300 passengers, only 600 survived. The rest died in the explosion, drowned in the dangerous currents, or died soon after their rescue. On 30 April 1865, Secretary of War Edwin Stanton created a board of inquiry to investigate the Sultana disaster. Rumors circulated that a Confederate had placed a torpedo in a lump of coal during the refueling in Arkansas, but nothing was proved. The board received testimony from surviving crew, passengers, and steamboat experts, but their reports only shifted blame from one person to another. Without conclusive evidence, the board decided that insufficient water in the boilers created the explosion, and that overcrowding did not cause the catastrophe. No individual was blamed for the tragedy, and no one knew definitively what caused the boiler malfunction. With the nation’s mind focused on the closing scenes of the Civil War, little attention was given to the Sultana tragedy. The passengers who were lucky enough to survive formed the Sultana Survivor Association, which met every 27 April. More people died in the Sultana disaster than did on the Titanic 47 years later, yet the tragic story remains largely overlooked due to the dramatic events at the end of the war. According to the National Park Service, “Sites at the bottom of rivers become land sites when the river channels change and get filled-in. In Tennessee, this happened with the paddlewheel steamboat Sultana. 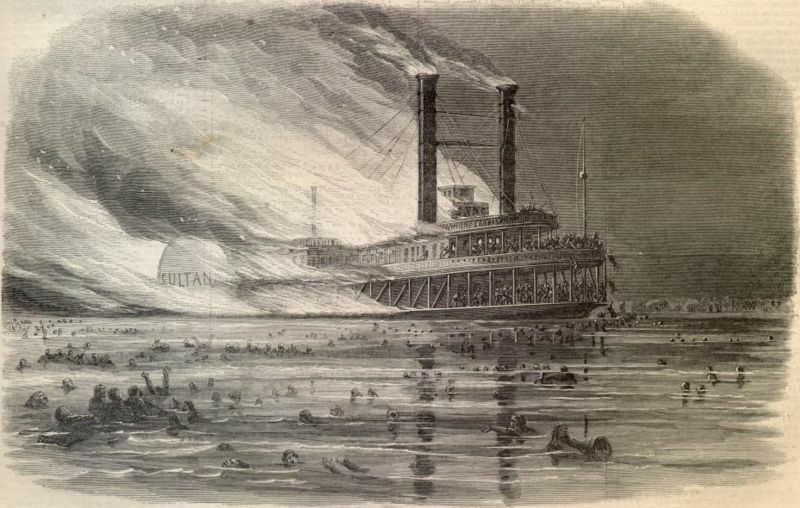 In 1865, just days after the end of the American Civil War and the assassination of President Abraham Lincoln, the Sultana exploded and sank in the Mississippi River near Memphis. Built to carry 376 people, the Sultana was overloaded with Union soldiers going home after release from Confederate prison camps. Accounts vary on the cause of the explosion and the extent of casualties but agree this is the greatest maritime disaster in United States history. In 1982, the remains of the Sultana were discovered in an old filled-in river channel near Memphis on the Arkansas side. Elliott, James W. Transport to Disaster (1962). Potter, Jerry O. The Sultana Tragedy: America’s Greatest Maritime Disaster (1992). Salecker, Gene Eric. Disaster on the Mississippi: The Sultana Explosion, April 27, 1865 (1996). Walker, John L. Cahaba Prison and the Sultana Disaster (1910). April 12, 1861 – Fort Sumter fired upon in Charleston, South Carolina. April 14, 1861 – Fort Sumter surrendered. A Proclamation by the President of the United Stales. Deeming that the present condition of public affairs presents an extraordinary occasion, I do hereby, in virtue of the power in me vested by the Constitution, convene both houses of Congress. The Senators and Representatives are, therefore, summoned to assemble at their respective Chambers at twelve o’clock, noon, on Thursday, the fourth day of July next, then and there to consider and determine such measures as, in their wisdom, the public safety and interest may seem to demand. Done at the City of Washington, this fifteenth day of April, in the year of our Lord, one thousand eight hundred and sixty-one, and of the independence of the United States the eighty-fifth. CARL RUSSO/Staff photo. Re-enactment participants in The Famous Olde Sixth Company I Massachusetts Militia of Lawrence Mass. from left, Sean Sweeney of Lawrence; Christian Padron of Lawrence; flag bearer, Morrgan Sweeney-Charlton, 17, and a sophomore at Central Catholic High School and Joe Bella of Methuen demonstrate a formation used to put down a mob while visiting the graves of Sumner Needham and his widow, Hannah in Lawrence’s Bellevue Cemetery. Sumner was a member of the Sixth Co. I Mass. Militia when he was killed by a secession mob in Baltimore in April 1861. The militia was traveling through Baltimore on its way to Washington to defend the capital at the start of the Civil War. 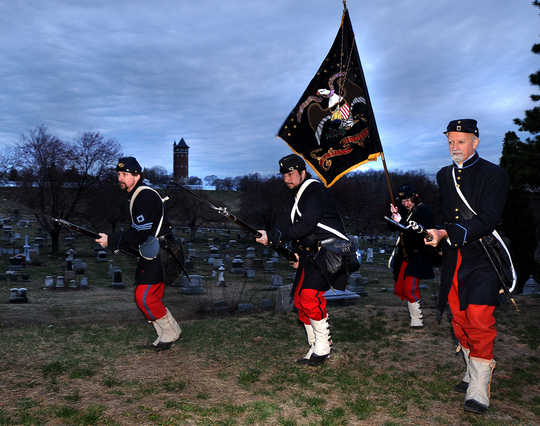 The Lawrence militia members will travel to Baltimore on the weekend of April 16 to participate in events to commemorate the 150th. anniversary of the Civil War and the mob attack on the Militia that killed Sumner. April 17, 1861 – Virginia secedes from the Union. April 18, 1861 – Harper’s Ferry, Virginia evacuated. April 19, 1861 – 6th Massachusetts Volunteer Infantry, while answering the call-to-arms attacked in Baltimore, Maryland while en route to Washington. April 19, 1861 – President Lincoln declares a blockade of the Southern Coast. April 20, 1861 – Robert E. Lee resigns from the United States Army. April 23, 1861 – Robert E. Lee assumes command of the Virginia State forces. April 29, 1861 – First Minnesota Volunteer Infantry mustered in at Fort Snelling, Minn.
April 29, 1861 – Confederate Provisional Congress convenes for its second session. April 30, 1861 – Colonel Thomas Jonathan Jackson occupies Harper’s Ferry, Virginia.